With a bass rattle counterbalanced by synthy melodies, the lead track – and previous single – ‘Soaked’ is one of the most direct examples of Diskopunk’s crossover sound. The grooves are rigidly funk and dance oriented, but there’s a hook laden song over everything drawing very heavily from a world of indietronica. The chorus melody is a cheeky one as there’s something irritatingly familiar about the descending vocal, almost as if it’s been lifted directly from Weezer’s ‘Hash Pipe’, but that only helps to push the number further towards an older indie crowd. By the time the second verse kicks in, Diskopunk lock into a sound that almost sounds like a disco-fied Muse, as traces of ‘Supermassive Black Hole’ sound like they’ve had their guts ripped out and then remixed by Justice. It’s certainly good start…and if that appeals, the rest of the EP – although a touch more varied – is of a similarly high quality. With a more instant melody throughout, ‘Breathing’ provides an early highlight with more of a crossover sound. Funk basslines are always a plus, but the way this takes a Chic-ish groove and fuses it with some very Scandinavian sounding indie very much creates a signature sound for the band. The indie elements occasionally float through the funk in a haze; the multi-layered vocals and soaring guitar parts – sounding like multitude of theramins – are definitely cool. By this point, things that occasionally sounded like a little clumsy on parts of ‘Soaked’ drop firmly into place, especially with Discopunk pushing the disco element of their sound. In a similar vein, but adding a few stabbed synths, ‘Lilla Pojke’ reinforces the pop, but retains a vague indietronica that feels as if Portugal.The Man have had an odd influence. The synthpop angle also reminds of the best Royksopp experiments, which obviously, lends Diskobox far more of a melody to their musical arsenal. That said, if you like synths and electronica but struggle with disco and pop, the overall enjoyment of Diskopunk will definitely still hang in the balance. 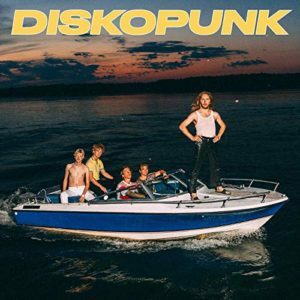 Across these five tracks, Diskopunk’s fusion of pop and dance styles is brilliantly constructed. All tracks need at least three or four plays before everything clicks, but when it does…it really does. With a couple of heavy throwbacks to the nineties and a fondness for funk guitar, this EP has the potential to cross over from pop into an indie audience, but anyone looking for intense sounds or any sort of edginess should probably look elsewhere. For anyone hoping to discover a more tuneful alternative to Yeasayer or something more interesting than the over-exposed Daft Punk, this self-titled disc will be more than worth the twenty minutes of your listening time. This entry was posted in Album & EP Reviews and tagged dance, diskopunk, funk, indie, indietronica, stream, sweden by Real Gone. Bookmark the permalink.